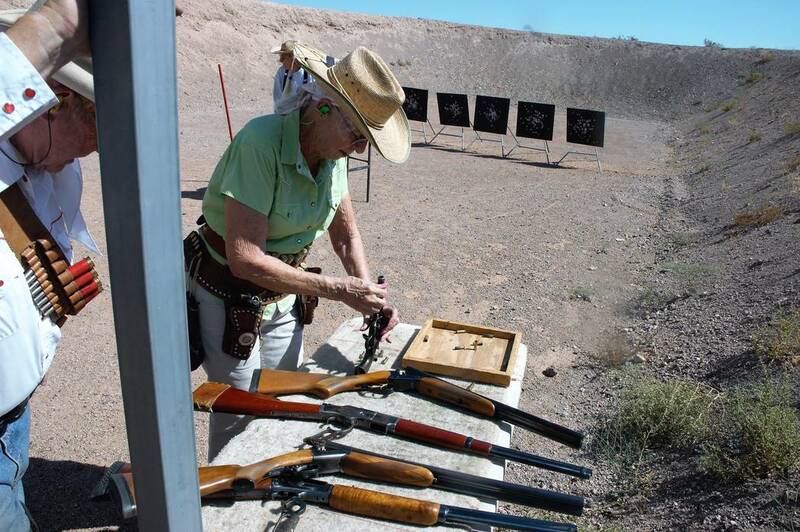 Hang around Southern Nevada’s outdoor shooting ranges long enough and you may have the pleasure of meeting folks known only by their cowboy aliases. Names like Creeker, Salt River Ford, Ace of Hearts, Quickly Downunder or Blazin’ Betsy. You won’t have to guess who they are. They’ll be the ones dressed cowboy style and carrying firearms replicating those produced before 1898. 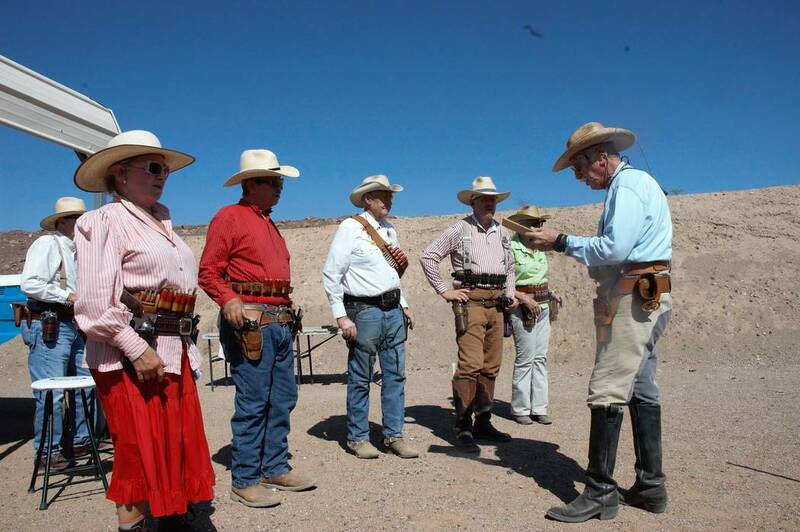 And when you do meet them, prepare to be entertained, educated and invited to come back for more cowboy hospitality. Such was the case on Saturday when I dropped by one of the Eldorado Cowboys monthly shooting matches at the Boulder Rifle Pistol Club in Boulder City. The Eldorado Cowboys is a local Cowboy Action Shooting club whose members have a passion for firearms reminiscent of the Old West. It is one of three such clubs in the Las Vegas Valley and five in Nevada. Each one is affiliated with the Single Action Shooting Society (SASS), the international organization created to preserve and promote the sport of Cowboy Action Shooting. Perhaps the most important parts are the costuming and the alias each shooter selects. The costumes are not just for show, and the names must be registered with SASS. 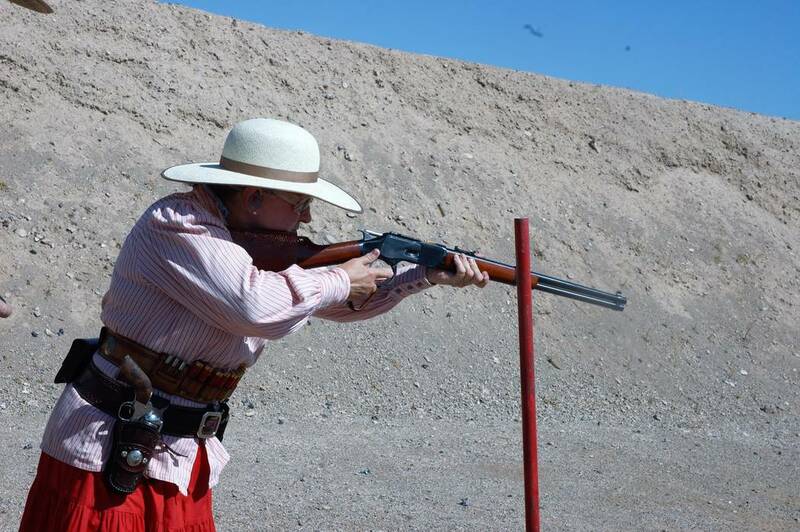 Despite their love of the old west, you won’t find cowboy shooters practicing quick draw or spinning their Colts during a match, but you will be treated to some fast shooting. Unlike competitions in which the winner is based on a numeric score reflecting the number of bull’s-eyes hit, the winner of a Cowboy Action Shooting match is the one who finishes with the fastest time and the cleanest shoot. A miss earns the shooter a 5-second penalty. Shooting targets out of order and other procedural errors costs the shooter 10 seconds. 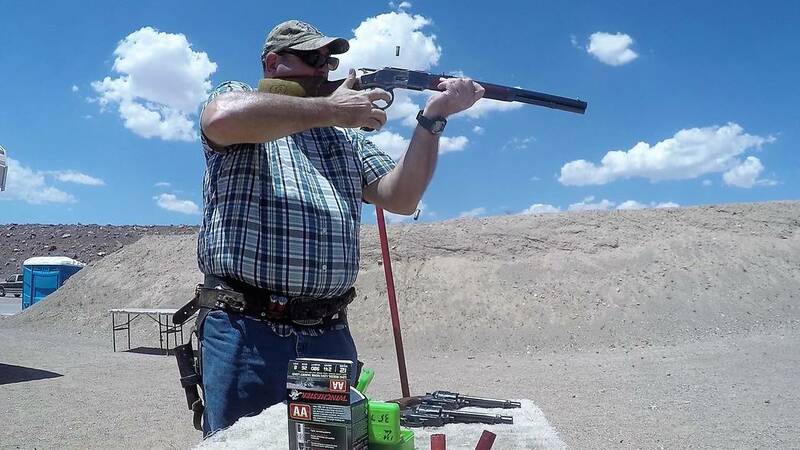 “This is the four-gun alternative to three-gun shooting,” said Creeker, who serves as president of the Eldorado Cowboys. As I watched, a few cowboys offered explanations of rules and pointed out things I should watch for as the competitors completed their turns. And almost without exception, my new friends said to keep my eye on the man who goes by the name of Quickly Downunder. 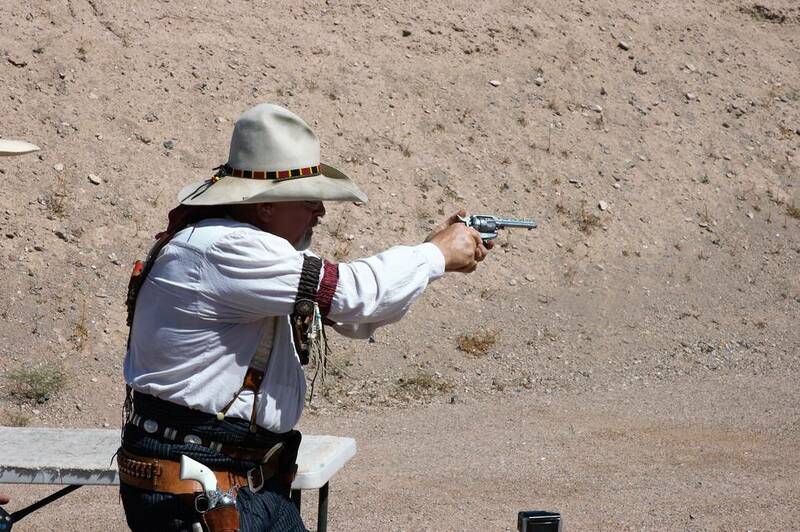 When it was his turn, Quickly loaded his revolvers with five rounds each and stepped up to the shooting line. When he was ready, he deftly loaded two shells into his double-barreled shotgun and just as quickly hit two targets. He then transitioned to his Winchester 1873 and fired 10 rounds, faster than I thought might be possible as he levered each round with a single finger. Then as if to put an exclamation point on what was sure to be his victory, Quickly emptied his revolvers one after another and did so quite, well, quickly. And most importantly, he finished the stage cleanly. His overall time was lowest of the day at 97.93 seconds for six stages without a single miss or penalty. Not bad for a man who grew up in Czechoslovakia where he never had an opportunity to own or shoot firearms. What Quickly could do, however, was watch American western movies and dream of being a cowboy. Quickly is one of the fastest cowboy action shooters in the world, according to Creeker. After watching him shoot I can believe it. Then it was my turn as Creeker, Salt River Ford, Ace of Hearts and Quickly Downunder placed their rifles, shotguns and six-shooters on the bench in front of me. A few minutes and a hundred rounds or so later, I was amazed at how fast one can empty a Winchester. With a smile I turned to look at Quickly, and he put his finger in the corner of his mouth and pulled with the motion indicating I was hooked. Freelance writer Doug Nielsen is a conservation educator for the Nevada Department of Wildlife. His “In the Outdoors” column, published Thursday, is not affiliated with or endorsed by the NDOW. Any opinions he states in his column are his own. He can be reached at intheoutdoorslv@gmail.com .